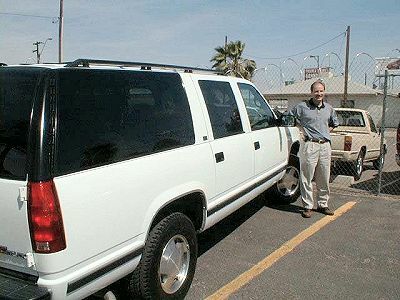 Above: Karl Typical and his '95 Burb. The inside air temp was not near cool enough on hot days for his wife and children...and he heard about it!! Obviously, much of the family's car time is spent at slow speed, traffic jammed conditions, causing the Burb's a/c system to come up a little short (or warm). Certainly, at highway speeds, the system works fine. Karl, now desperate, goes to Jerry Alexander of “Auto Air, Alarms and Accessories.” Jerry checks out the system and finds that it's still at factory conditions. There's not a lot he can do to improve the performance short of a very expensive, major redesign. 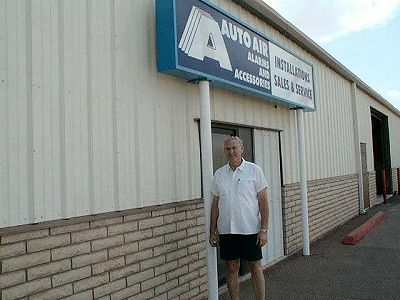 Above: Jerry Alexander, owner/technician of Auto Air, Alarms and Accessories (Phoenix, AZ) performed the FOT to Smart VOV exchange. Then Jerry remembers reading something about the Nartron Smart VOV™ (Variable Orifice Valve). He speaks to Warren Willingham of www.acsource.com. Warren suggests that the Typicals' Burb would be a great test vehicle for the VOV because it is so…typical! They speak to Karl, there is agreement and an installation is arranged. The VOV was installed on an 85° day. The truck will be brought in for reexamination of the system on a much hotter day to come. 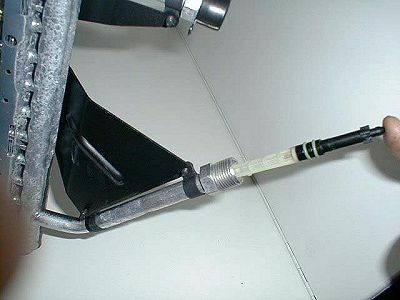 Above: The Burb uses a condenser mounted orifice tube. Shown is how the original FOT can just be replaced by the VOV. Below: Inside Jerry's shop in March. 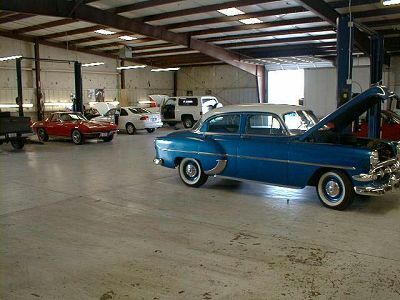 Empty bays are showing that will surely be filled by the time you are reading this article. Below: Performance comparison of before and after VOV replacement. For an update to this article, click here.